If there is any food group that evokes universal comfort, it’s meatballs. Not only do meatballs simply taste great, they are present in nearly every cuisine and enjoyed by children and adults alike. Your mother likely made meatballs and so did her mother, and chances are that you are also making your own. As with many homey and rustic meals, meatballs are an economical means to stretch inexpensive cuts of meat by jumbling the ingredients together with extra fillers, such as breadcrumbs and egg, and plenty of herbs and spices for great flavor. Then, depending on the mood or craving, the meatballs can be braised in robust sauces and stews, ladled over noodles, swiped in dipping sauces, and piled into double-fisted sandwiches. There is a meatball for everyone and every preference, and bets are that you’ve been nibbling on meatballs since you were old enough to wrap your fingers around them. 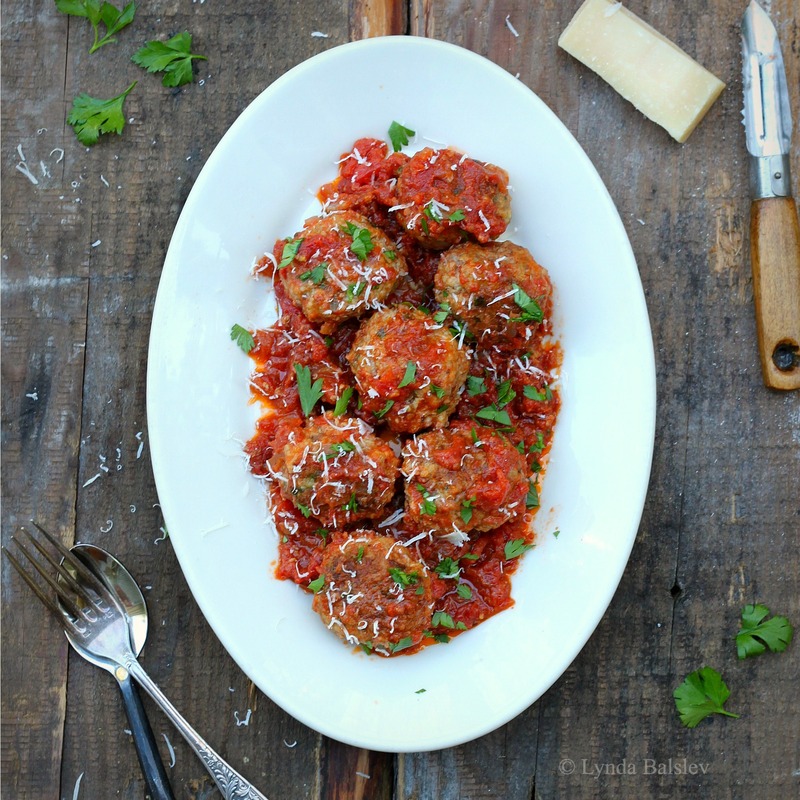 This is one of my favorite meatball recipes. The key ingredient is a generous amount of grated Pecorino Romano cheese, which melts into the meat and adds rich, umami flavor. A kick of crushed red pepper flakes doesn’t hurt either. (You can reduce the red pepper if you prefer a milder version.) These meatballs can easily be frozen, so if you make too much (never a problem) or double the batch, then wrap the extras well in plastic and freeze for up to 1 month. Allow them to defrost overnight in the refrigerator before cooking. Heat the oil in a large saucepan over medium heat. Add the onion and sauté until softened, about 3 minutes. Add the garlic and red pepper flakes and sauté until fragrant, about 1 minute. Add the remaining ingredients and bring to a boil. Reduce the heat and simmer, uncovered, until slightly thickened, about 20 minutes. 1. Heat 1 tablespoon olive oil in a large skillet over medium-high heat. Add the meatballs in batches, without over crowding, and brown on all sides, about 5 minutes, turning as needed. (The meatballs will not be cooked through at this point. They will continue to cook in the sauce.) Transfer to a plate and repeat with the remaining meatballs. 2. Add the sauce to the skillet and cook briefly over medium heat, stirring up any brown bits in the pan. Add the meatballs to the sauce and turn to coat. Cover and simmer over medium-low heat until the meatballs are thoroughly cooked through, about 30 minutes. Serve garnished with chopped parsley and grated cheese.